Your roof collects a lot of water during a rainstorm, so why not use it in your garden rather than sending it down a storm drain? You can find rain barrels at many hardware stores, and if you are handy you can make one yourself. Reduce your use of yard chemicals and don’t apply fertilizers or pesticides if you know it’s going to rain. 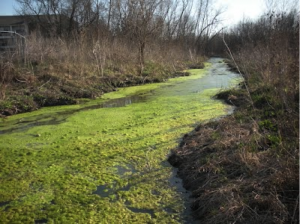 When nutrients from fertilizer are washed into a stream they cause algal blooms, which are not only bad for the stream, they are also unattractive and smell bad. You can test your soil to see if you even need to add fertilizer. And needless to say, pesticides are definitely not good for streams. A healthy yard won’t need as many chemicals, so its a win-win situation. 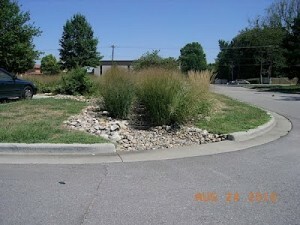 Rain gardens are a beautiful addition to your yard and can retain a lot of stormwater runoff. 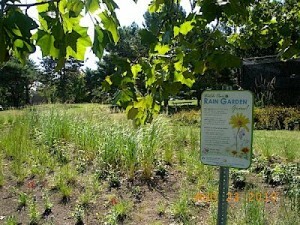 Think about planting rain gardens to catch water running off your lawn. 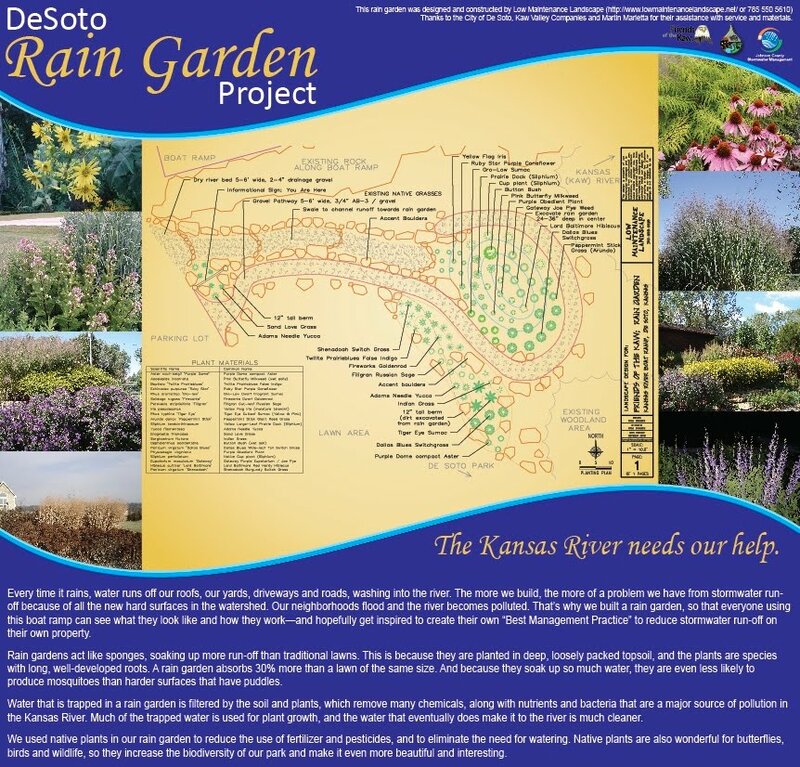 You can see what one looks like by visiting the Friends of the Kaw’s rain garden demonstration at the De Soto Riverfest Park boat ramp or going on the JoCo BMP tour. 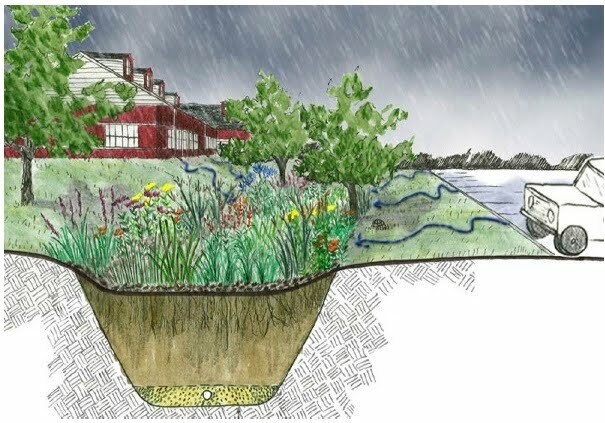 Native plants need less watering, fewer pesticides and herbicides, and grow deeper roots to catch runoff. To identify appropriate natives for use in our area the Kansas Native Plants Society, Grow Native, and Kansas Native Plants websites all provide online resources. Don’t mow within 10 to 25 feet from the edge of a stream. Leave a buffer. This will reduce the amount of runoff entering the stream. 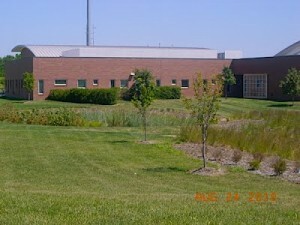 Native grasses, bushes and trees act as a filter to stop sediment, trash, and pollutants from entering the stream. 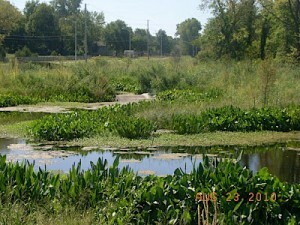 Plants also absorb excess nutrients in runoff, preventing harmful algal blooms in the stream. 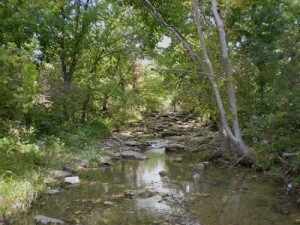 Bushes and trees along the bank are the best way to prevent erosion. Leaving a buffer is the most effective way to stop erosion, since bushes and trees have stronger, deeper roots that hold the bank in place. Concrete rubble, tires, trash—these are not good for the stream, they don’t work to prevent erosion, and they are ugly. On top of that, they are illegal. 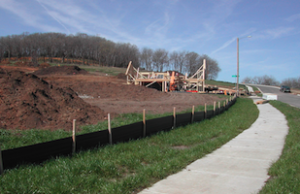 Municipalities in Johnson County have developed their own regulations for streambank stabilization (Overland Park’s regulations can be found here), so make sure you check with your local government before beginning a stabilization project. Reduce the area covered by hard surfaces. 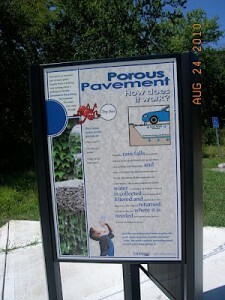 If you have a walkway that is seldom used, consider replacing hard surfaces like concrete, brick or asphalt with a pervious surface like mulch, gravel, or pervious pavers – learn more about pervious pavement. 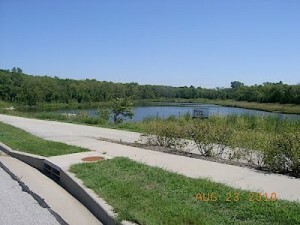 You can also visit local projects in the JoCo BMP Tour. Sweep or blow your driveway rather than washing it off with a hose. 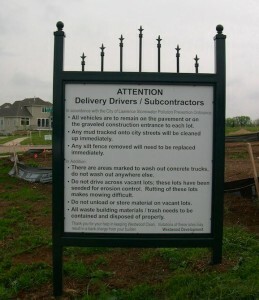 This will reduce the amount of runoff that goes into storm drains. And use commercial car washes, which are required to manage their wastewater with sand-oil filters, rather than washing your car at home. Never pour oil or other chemicals down storm drains. What you pour onto your driveway, roadway, or directly into storm drains. What goes down the drain goes to the river, untreated, and will contaminate the water we drink and the fish we eat. And remember that oil and water don’t mix—please recycle your used oil. It is amazing how much pet waste can accumulate in your neighborhood. 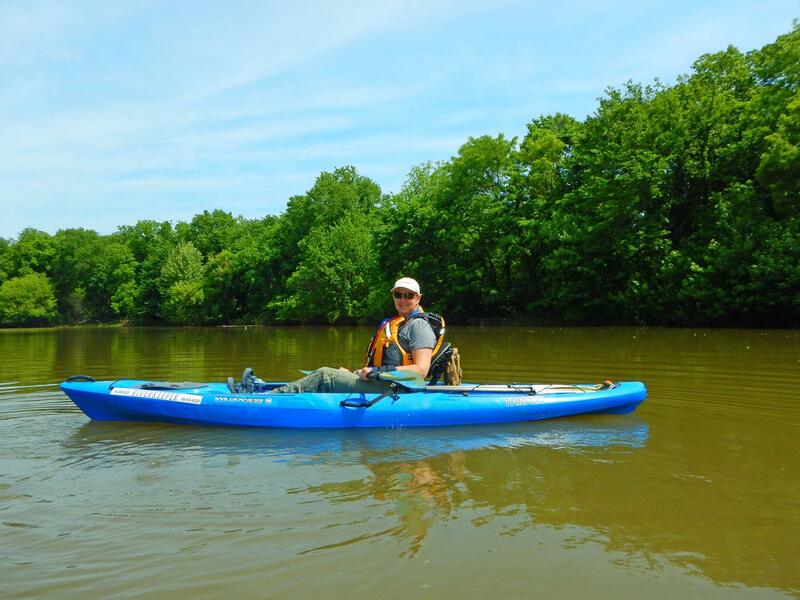 By picking it up you can reduce the amount that gets washed into streams during storms, and that reduces the amount of bacteria and nutrients that wash into the river. Don’t fancy the idea of scooping poop on a regular basis? A directory of businesses that manage pet wastes, or “commercial pooper-scoopers,” can be found online.